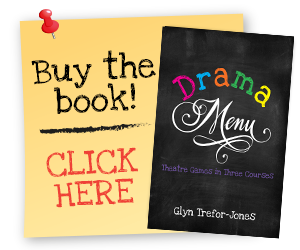 Drama Menu is a book of theatre games, improv ideas and drama games that will make your drama lessons planning as easy as 1-2-3! The book categorises theatre games into three distinct collections… choose one theatre game / drama exercise from each collection and “hey pesto” (stay tuned for more gastronomic puns! )… with minimal effort, you have a tried and trusted, ready-made drama lesson plan that is crammed with creative ideas, fun-filled theatre games, original improv ideas and countless ideas for drama! Drama Menu contains 158 drama exercises, theatre games and ideas for improv… this makes a staggering (and rather neat) 1,000,000 possible theatre game combinations! With such a wide range of theatre games, drama exercises and improv ideas, you will never be stuck for a drama lesson plan again!